ANNAPOLIS, MD (September 15, 2006) – Wineberry (Rubus phoenicolasius), a cousin of Raspberries, is one of a number of species and hybrids in a diverse genus. The plant was introduced into the United States from Asia in 1890 as breeding stock for Rubus cultivars and is still used today by berry breeders. Although it is a useful plant when contained, wineberry is considered a pest now that it has escaped into agricultural and natural ecosystems. Wineberry has naturalized from New England and eastern Canada south to North Carolina and west to Michigan and Tennessee. It is found in forest, field, stream, and wetland edge habitats and in open woods and light gaps, preferring moist soils. It is considered an invasive plant in Maryland, as well as in neighboring Virginia, West Virginia, Pennsylvania, and the District of Columbia. Though it is past fruiting season, the red-bristled canes of Wineberry are distinctive this time of year, so MISC has named it September’s Invader of the Month. Like other brambles in its genus, wineberry forms a clump of arching canes that may reach nine feet in length. Canes may stay vertical or bend toward the earth, rooting again where they touch and producing more canes that can form dense thickets. The species’ tongue-twisting scientific name literally means “blackberry with purple hairs,” an apt, though not entirely accurate description. Younger canes in some patches may maintain a greenish color, but mature plants have canes that are covered with distinctive glandular reddish or brown hairs and weak spines. The hairs give the canes a soft reddish color when seen from a distance. 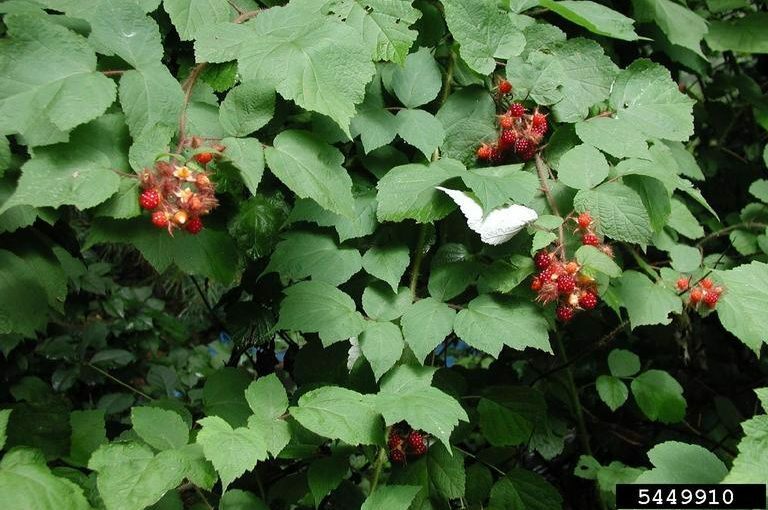 Wineberry leaves are compound, alternate along the stem, and divided into three heart-shaped leaflets with serrated edges, purplish veins, and silvery white hairs on the leaflets’ undersides. Small green flowers with white petals and reddish hairs occur in spring. The very edible raspberry-like fruit ripens to a bright, clear red in June and July. Wineberry’s rapid growth poses a threat to native plants by creating dense patches that crowd out desirable species. It spreads not only vegetatively by tip-rooting but also by seeds transported by birds and mammals, including human beings, who seek out the delicious fruits. Wineberry is difficult to control and should never be deliberately planted. Small infestations can be handled by pulling individual plants—if the soil is moist—or digging them out with a shovel or 4-pronged spading fork. Where accessible, canes can be mowed with brush-type equipment. In some areas workers may need to use brush-blade power tools. In either case, low re-growth can be treated with foliar applications of glyphosate or triclopyr herbicides (e. g., Roundup, Rodeo, Garlon 3A, or Brush B Gon).